My best friend lists potato chips as her favorite food, so I thought she would enjoy having her cake and chips too! I got the idea from a bag of Lays chips cake I had come across on the internet. I used a chocolate cake mix (for the sake of time)and she had specifically requested chocolate. Next I trimmed the cake into the shape of a chip bag. Then I covered that with Marshmallow fondant (MMF) I had colored royal blue. I shaped the cake to look a little crinkly and hollowed out the top a little so I could fit the chips in. I dyed the fondant for the labels a lighter blue (just used less royal blue) and applied to the cake. Then I wrote on the cake with white buttercream. I thought my friend would enjoy the "O calories" as opposed to what the bag actually said, "0 trans fat". Then I wrote a Happy b-day message for her. My writing certainly needs improving, however! For the actual potato chips, I dyed the Marshmallow Fondant with some golden yellow, lemon yellow and a little brown, then I used an oval fondant cutter to cut them out. I then used a pastry cutter to imprint both sides (for the ripple chip effect). It worked well, but you have to do it 2X at least on each side, but not press too deep or you'll cut the chips. I shaped the chips to look like actual chips. I put about 25 chips on top of the cake to make it appear like chips were spilling out of an open bag. 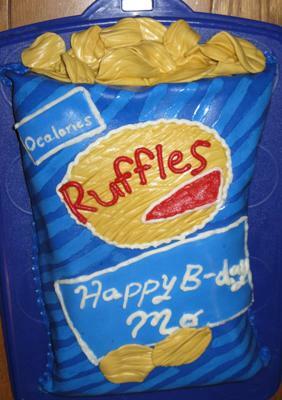 Then I cut a big chip for the logo, applied it and wrote the "Ruffles" name in red buttercream. I outlined it with white buttercream. I applied 2 potato chips on the bottom on the lower blue band (as on the actual bag of chips I used as a sample). It will be tough to cut this cake! Great Job! Such a beautiful and colorful cake. But you sure did a great job. I'm impressed! And I love the idea of chips! Thanks! The glossy chips weren't actually intended. It was my first time working with Marshmallow Fondant and I ended up using a lot of crisco to keep it from sticking to my hands and the board I was using - it's really sticky stuff! Very pretty and so details...love it. Wonder how you made the chips so glossy? What do you use? Thanks for sharing .